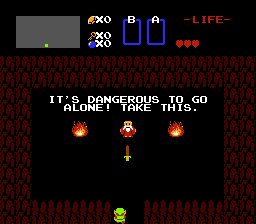 Every fan of the original The Legend of Zelda knows the line, “It’s dangerous to go alone! Take this.” On the very first screen, a lone cave entrance stands out from the rest of the view. When you walk inside, you’re met by an old man who says that line and gives you a wooden sword. Talk about humble beginnings for Link. On the surface, it’s a casual statement meant to give Link the right tool for the job. I’m going to skip that, though, and take a deeper look at the statement and how it applies to life and relationships. There are better examples of getting the right tool for a given job, so I’ll save that for a later post. Let’s dive into that statement and look at it as a metaphor. In life, “it’s dangerous to go alone.” People are meant to be in relationship with one another. Let’s start with a job analogy, using a large department store. In order to make the store run, you need cashiers, people to stock the inventory, people to handle payroll, people to handle the bills, and so on. You get the idea. Without all those people, the store wouldn’t function properly. Can a store be run by a single individual? Sure, people do it all the time (especially online). But those stores can’t grow very big. As soon as a store gets demand for more than a few personally handcrafted pieces, more people will be required to grow. Even sourcing out products requires other people – somebody has to make the products. Here’s another example. I’m a programmer. I developed this website. I also know my weakness is artistic design. So instead of trying to create some mediocre designs, I had an idea and passed the idea to someone else who is far more talented than me in that area. Even though the development of this site was my own work, I didn’t do the entire thing alone. I brought in help for the areas I couldn’t cover. Now, let’s look at the relationship level. As I said, people are meant to be in relationship. The old man may have given Link a sword to start with along with a casual statement, but as we’ve touched on already, it’s a solid piece of advice. In one sense, Link went through much of his journey alone. However, he met others who helped him along the way, and ultimately, Zelda. In the end, after Link rescued Zelda, it was through their companionship (they each held separate parts of the triforce) that peace was restored to Hyrule. Let’s apply that idea to life now. When people are alone for long periods of time, it can be literally dangerous. Several studies point to the negative effects of long term loneliness and isolation. Increased rates of heart disease, high blood pressure, more frequent illnesses, and higher mortality rates are just a few of the effects of loneliness and isolation. What’s worse is that these dangers can come from perception alone – if a person feels lonely or socially isolated, they are just as likely to develop the same symptoms as someone who is physically isolated. In those cases of loneliness, whether perceived or not, it’s easy to spiral into depression. As far as perception goes, it really is easy to feel lonely even when you’re surrounded by people, especially in today’s social media crazed world filled with many acquaintances but few real friendships. Don’t get me wrong, social media definitely has it’s merits, but as far as our mental, personal, and spiritual health goes, it’s far better to have five close friends than it is to have 500 shallow acquaintances on Facebook, Twitter, etc. During the many alone times of Link’s travels, he was in constant danger from monsters. Yet he found moments of refuge and healing from fairies who gave magical healing, old women who sold him medicine, friendly monsters who gave hints, and so on. Like Link in those times where he met friendly people and creatures, our general well being is enhanced by, and to a certain degree dependent on, real relationships. In the Bible, shortly after creating man, God said “it is not good for the man to be alone” (Genesis 2:18a, NIV). Relationship is one of the core tenets of the Bible. The stories and principles given teach the benefits of positive relationships. There are even warnings about toxic relationships, but that needs its own post to really dive into. As gamers, we have a unique social position in the world. I’ve seen a variety of relationships form because of games and the gaming culture. I’ve witnessed friendships, and even some rivalries, born in old arcades. I’ve watched relationships develop from simple acquaintances in a guild/clan to deep friendships and even marriages. Game stores that offer community events are an excellent place to meet other gamers and find a community. Sure, it can be intimidating (or downright scary) to talk to someone you don’t know, but when they’re done right, those events and communities are incredibly welcoming. If you’re feeling lonely, do what you can to find healthy companionship. Everyone needs a friend. Everyone needs people around them to encourage them. Everyone needs people to help them up when they are down.